From the 21st to the 24th of September I flew to the city of Copenhagen in relation to our project Parasite Radio, part of Pixelache Festival during 22nd-24th September 2017, Helsinki. The goal of visiting the capital city of Denmark was participating at City Link Festival as an observer and independent participant, recording parallel soundscapes, happenings or specific sounds related to the city and the Festival program of events. Also, Parasite Radio looked for the creation of a node between these 3 international cities and their respective Public space Festivals. Pixelache Festival in Helsinki, Finland. City Link in Copenhagen, Denmark. And last but not least Transitio Festival in Mexico City, Mexico. The purpose of this amalgam was creating a link-node using the radio experience, connecting the 3 cities through sound and Radio program contents. Parasite Radio was a project organized by Juan Duarte, Mikko Lippiainen and myself inside Pixelache Festival 2017 umbrella. It started as an international effort of producing streaming radio content including soundscapes and sonic experiments. Attempting to follow the avant-garde spirit of creatively abusing the limits of the radio medium via online and short-range spectrums, the experiment presented collaborative alterations in the radio mediums to enable telematic appropriations of the Signals between the North and the South. The experiment was part of Signals from the South, being the project Aeolian inside KOELSE AND PIXELACHE: 15 YEARS exhibition at MUU galleria, Helsinki, Finland between the 22nd and 26th of September. During that time Parasite Radio was retransmitted via Korppiradio (http://korppiradio.net) broadcasting a dynamic playlist of sonic materials, including archives of sonic experiments by various contributors, being myself one of them. I also did curate a small a selection of different sound projects from different Finnish-Danish artist. City link Festival is an international project connecting different cities all around the world. Copenhagen, Edinburgh, Hamburg, Paris, Istanbul and in the near future Akron, Ohia. City Link celebrates local and international communities in a festival, connecting with a new city each year. It defines itself in the intersection between art, design, architecture and urban, a space that personally opens many questions in terms of the meaning and impact of creative industries globally. Anyhow, my visit permitted me understand the nature of the Festival, not so close from Pixelache’s road map as I firstly thought, and its different program of events. My first introduction with the Festival was my assistance to the conference Exploring Experimental Cities. The event was host at the DIST center, Aalborg University, in cooperation with GivRum. The conferences purpose was to gather researchers, planners, developers and artists/activists to a three-day exploration of how to create more livable and sustainable cities through experimental urban development. I assisted and hang around different presentations. Art as urban transformation versed on art and performance as tools of urban transformation. Also the presentation at the auditorium called Between apocalypse and utopia took my attention, as it explored the roles of experimental utopias and interventions. Other interesting presentations were Memory, Mindfulness and Place Awareness; the keynote “Architect as host” by Torange Khonsari or Floating Narratives. Even the topics of the presentations were interesting and necessary, the public and the context was pretty different to the public and context of Pixelache Festival, being the Danish one in my opinion more commercial and business oriented. I was also assisting to the different projects which took place around the Festival itself. During the first day, on Thursday, my first contact with the Festival was a community dinner project. A really nice location permitted the interaction of different people as Festival participants, artists, public, neighbors and curious, which created a really cozy and sweet atmosphere. During second day, Friday the 22nd, I remember very well the project Times capsules installation. The Polish art collective Robosexi created living time capsules for Sydhavnen neighbourhood, using small objects from the local area embedded in resin, and used to replace paving slabs, holes in the wall, and other small spaces. Another project that took my attention was Do The Buildings Talk To Us - And Do We Listen? An interactive sound installation that connected sound art with disused urban spaces, to bridge the gap between the local citizen's daily urban life and their connection with the urban environments that surround them. But my favorite one happened on Sunday afternoon. 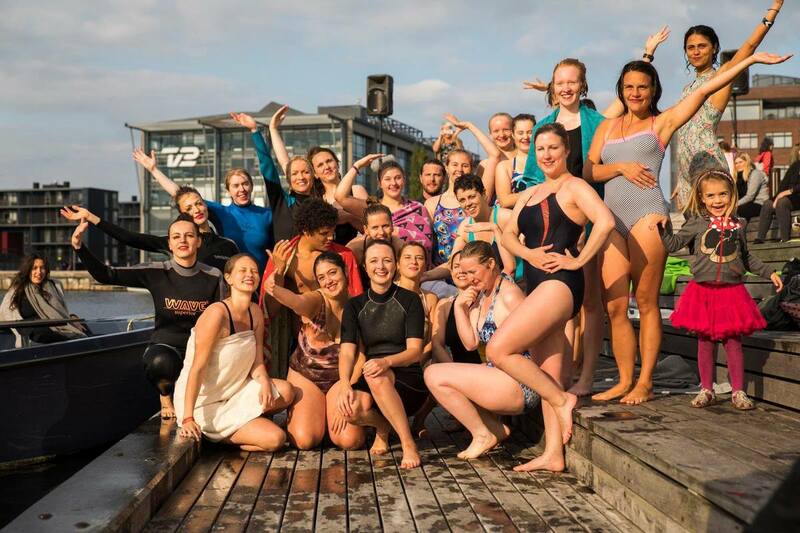 During this project, 25 swimmers jumped in to Copenhagen's harbour to perform an urban synchronized swimming routine, being all amateurs. The event was created by GivRum as part of the City Link festival, to celebrate Copenhagen's urban space and clean water harbor. The classical music band Halvcirkel performed Philip Glass piece Halvcirkel, creating an amazing atmosphere all around the harbor packed with people who enjoy the different activities which happen around, being the mobile sauna one of the most attractive ones. I also did record different situations and soundscapes during my visit to Copenhagen, being the sound documentation of the last project I wrote about, Underwater Ballroom, one of the selected materials for Parasite radio program. Also, we did retransmitted during the weekend other contents I did file. An Urban space intervention by a bike with a sound system attached to it through Copenhagen city center. An atmosphere recording of Møllegade street, Copenhagen city center. Or an Anti-gentrification public space concert where different bands and political talks remembered the dramatic urban transformation of Vesterbro neighborhood and its popular heritage against the neoliberal gentrification processes in the area. Resuming my experience, my visit to City Link Festival helped me to understand the situation of Copenhagen in relation to Festival managing, creative industries, Urban development, and the difficult situation of the artists in the intersection of those territories. That situation made me ask myself: are artists creators of contents? Should art be used as a creative industry force? Can Art be Art without productive goals? I do have already my answers for all these questions.